This grand estate is not only one of the largest rental villas on the entire island, it also is a notable landmark. Virtually anyone on island is familiar with the Castle in the East End. While we are neighbors to the Wreck of The 10 Sails Park and the police constable's residence, this property enjoys no residential neighbors to the north or south for a good 500 feet in either direction. With the Castle gate shut in the evenings, guest can enjoy their privacy. The owner takes immaculate care of the home making upgrades every fall to keep the experience not only refreshing and pleasant for the repeat guests, but for newcomers to Cayman Island as well. 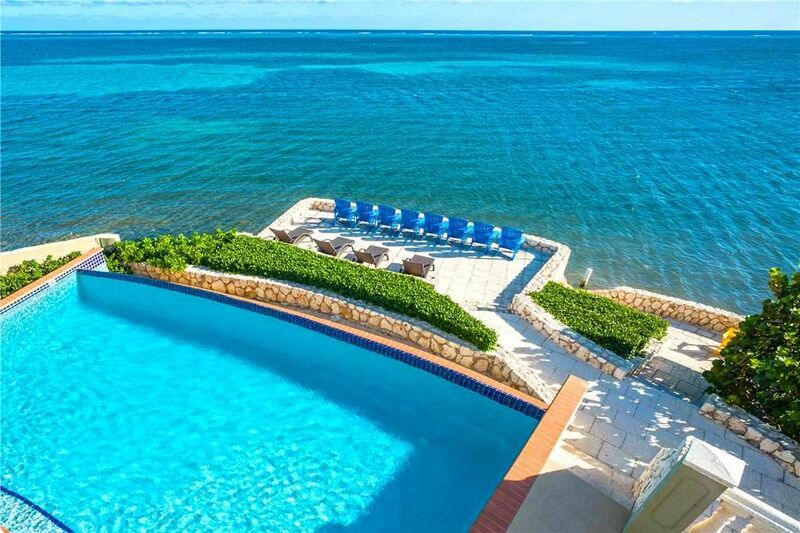 — Two oceanfront pools! The main house features a gorgeous oceanfront infinity pool (heated to 84 degrees in the winter), while the guesthouse enjoys a smaller but very private pool. — 300 feet of Private White Sand Beach. Step off our driveway onto white sand! — 3 thatched beach palapas, 4 kayaks, and walking distance to Ocean Frontiers dive shop, 3 restaurants make this home a convenient choice for larger families. — Custom 17-foot mosaic dining table on the main porch seats 18 easily and offers panoramic views while you dine. — A flight of stone steps from the pool deck take you past the Adirondacks and loungers on the sunny patio and down to the water, where guests can enjoy excellent snorkeling or kayaking. A healthy marine ecosystem awaits your discovery—so we ask that you wear pool shoes or fins when you to exploring! — Stainless steel propane grill and prep area with granite countertops. — Wide driveway with plenty off-street parking for guests. — Lounge chaises and outdoor sectionals on pool decks, porches, and balconies for guests to relax in style. — Multiple roofed verandas at both Castle & Guesthouse provide guests protection from the sun and rainstorms. — King and queen suite on second floor. Bunks in the second floor queen suite for overflow and families with small children. — Queen suite and separate bunk room (two full-over-full bunks with ensuite bathroom) on first floor. The first floor queen suite offers a private exterior entrance with seating and TV. — Kitchen, dining and living area are all oceanfront on the second floor, offering lovely views through the multiple sliding glass doors that lead to the main level porch and outdoor dining area. — The full modern kitchen features double ovens, dishwasher, refrigerator, stovetop, microwave, Keurig coffeemaker, Kitchenmaid mixer, Bunn drip coffeemaker, tons of counter space, and bar seating for six. — Indoor dining seating for six. — Comfortable living area with large flatscreen TVs for unwinding after a day of sun and surf. — Serving bar with wine fridge adjacent to the lower level pool deck. — Oceanfront master king suite with beautiful views, desk, large chairs and large walk-in shower. — Oceanfront queen suite with two bunk beds, large chairs, dual vanities and walk-in shower. — Full modern kitchen refrigerator, dishwasher, stove, oven, microwave, blender and coffeemaker. — Comfortable sectional sofa with large flatscreen TV & Bose speaker bar. — Similar outdoor sectional sofa as well as Adirondack chairs. — Dining table seating for 4. Both homes come equipped with central A/C, complimentary WiFi, Apple TV, plus indoor and outdoor bluetooth speakers. The kitchens are stocked with dishes, glasses, cookware, and utensils. Linens, towels, and beach towels are also provided for guests. Cayman Castle also makes an intimate wedding venue for small ceremonies with no more than 18 guests. *Note: Property includes 4 kayaks, ADDITIONAL Silver Thatch kayaks available for discounted rental. Signed waiver and 5 day minimum required with 6th and 7th day free: US$39 per day per kayak ($195 per week/each). Paddles included. — Owner requires refundable $1,000 Excess Cleaning and Damage Deposit. Owner purchased the condemned hulk of a 2 story castle in 2002 along with 750' of shore from a foreclosure sale. Sold the last 200' of sandy beach to a friend and later sold another 100' keeping 450' for the Castle. Neither owner has built on the sold lots as of yet, but Castle's owner would like neighbors! The Castle sits 24' above sea level with a commanding 180 degree view of the east end reef. Easily within walking distance of the best dive shop in the Caribbean, Ocean Frontiers. Owner added a large infinity pool, 2 bedroom guesthouse with pool, and a third floor to the Castle as well. Privacy and seclusion amid a unique space with sweeping panoramic views. The stone patios offer guests the opportunity for stargazing at night and to observe the kite-boarders and dive boats during the day. Eagle Rays have been spotted in the shallows in front of the Castle. Indoor dining seating for six at the main home, 4 at the guest cottage. Custom 17-foot mosaic dining table on the main porch seats 18 easily and offers panoramic views while you dine. Serving bar with wine fridge adjacent to the lower level pool deck. 300 feet of private white sand beach. Step off our driveway onto white sand! Walking distance to Ocean Frontiers dive shop, 3 restaurants make this home a convenient choice for larger families. Just a magnificent spot. Owners and rental corporation were prompt and friendly. Cleaning staff the same. We had a wonderful stay. After a long day of traveling we arrived to a house that was not ready for us due to the late checkout and messy conditions left by the previous occupants. The cleaning service were very nice and apologetic and promised to hurry but it was well after check-in before we were able to settle in. Driving up to the house, it really does look like a small castle with beautiful views of the water. The main house is on one side of the parking area and the guest house is on the other. There is enough parking for three cars. The location of two of the bedrooms in the main house were a little odd, one looked more like a storage room and the other you had to go outside to get to. It took a long time to get hot water to the third floor bathroom. The second floor to the main house was nice and comfortable with plenty of seating for our family of 12. The patio had a great view of the blue water. There was a black bird that tried to get in the windows of the stair well every morning at 6:30 and he was loud and very insistent The kids thought that was very funny. The guest house was nice but the living room furniture was not very comfortable. We did enjoy the private pool. There were large iguanas sitting on the garden walls every day. The private beach was dirty and the water was brown and covered in seaweed and sea grass so we were not able to use it. We were told that this was unusual and due to seaweed coming from a different country. It was all along the east coast beaches. The location of the house was in a very quiet area with a few restaurants, marinas and a small grocery store nearby. It is also right next door to a police station. The Wreck of the Ten Sails Park is within walking distance but it is not much to see. It was about an hour drive to the airport and to seven mile beach, which is beautiful. The Turtle Farm is also about an hour drive but worth the visit. It is about a twenty minute drive to The Queens Botanical Gardens, some of the family went to this and enjoyed it. It was about thirty minutes to Kaibo Marina where we went for a snorkeling/stingray adventure. Highly recommend this. It is a short drive to the blowholes, which are worth the stop. Some of the family played golf at Arnold Palmer’s golf course and said it was beautiful. Eagle Rays Restaurant is within walking distance and the food is pretty good. Despite the few negatives, we enjoyed our stay. This was my second stay in the Cayman Castle. It's a beautiful home with all the amenities. The kayaks were a great addition since our last stay there many years ago. It's now possible to kayak out to the shipwreck site and snorkel around the coral reefs. We drove over to the Silver Thatch Guest Services building, which had just opened, and were able to work out in the gym and check out brand new snorkel equipment. The east end of the island seems to be more developed in recent years. We enjoyed eating at Italian Kitchen (3 times! ), Tukka, and Eagle Rays. They were all very good and the service was great. in the bedrooms in the villa did not work. We did call. No response. The pools were beautiful and well maintained. We did feel the towels, especially the face cloths were rather shabby and need to be replaced. And, for some reason we assumed that the iron gate at the road could be closed at night. Nothing electronic and impossible to move. Lighting between the two residences could be better. Or, provide flashlights at the entrances and exits. Everyone seems to know the Cayman Castle and it was easy to call for restaurant reservations. We utilized one restaurant service offering transportation for large groups - we numbered 10. It allowed us to dine out and enjoy without worrying about darkness and a winding road. Although there was little sun, the majority of the group were business owners or elected officials and having very relaxing days reading, eating and talking made for a wonderful time. Positives: 1. spectacular views, 2. private beach, 3. great owner, 4. lots of private areas, 5. access to reef very close, 6. great fishing off the dock, iguanas large and exotic, 7. sunrise and sunset both awesome to watch from the same decks, 8. next door to largest dive operation on the east end, 9. very private. We had an awesome time at the Cayman Castle! Our experience was fantastic and will be remembered forever. We hope to do it again someday! 2-3 lunch places are within walking distance and Tukka Restaurant is only a mile north. Two miles north are the 2 large resorts (Morritts and The Reef) where they maintain manicured beaches, pools, restaurants, bars and watersports. Those resorts are great places to entertain older kids and for anyone to spend the day.